Static and User Friendly URLs – It is one of the tuff task to manage URLs for ecommerce website, as an E-commerce website have thousands of web pages and most developers create dynamic webpages for product and category based on the product id. Dynamic URLs are not easily to remember and difficult to index also search engines recommended using static URLs for the web pages. If we make static URLs for e-commerce website, we can include our main targeted keywords within the URLs and increase keyword relevance and keyword prominence, which will help web pages in search ranking. Define Product Pages and Category Pages URL Structure – Category and product pages URL should be defined earlier as per the requirement of tracking. Plan and think before what you want to track in Google analytics and how you can track them. Suppose if you want to track the individual category and its relevant product performance report then how will you manage and track the conversion? What URL structure will helpful for you? You need to make a proper directory structure for product and category pages; this will be depending upon your requirement. 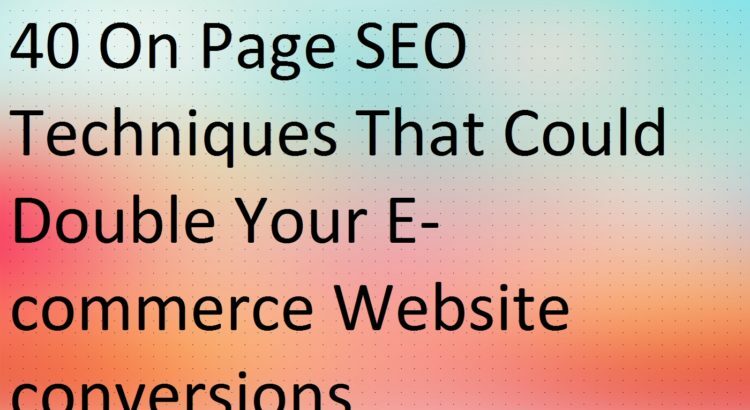 Avoid Duplicate Product Page URLs – If you will not define proper directory structure for product pages then you can face the duplicate product page URLs issue because one or more products can display in multiple categories. It can be solved by implementing canonical tag on the product pages but it will be difficult to identify the list of products which are appearing in multiple categories, therefore it is most important to define a proper directory structure for the webpages. Mobile Friendly or Responsive Website– As Google is going to lunch new Mobile-Friendly Algorithm and it is most important to target mobile users. We must design our website mobile friendly. Keywords Analysis – As keywords are most important for business, we should do category, sub category and product based keyword research and finalization, always chose long tail keywords. Unique Meta Tags for Webpages– Based on the selected keywords, we should create a unique and attractive Meta tags for Category and sub category pages, for product pages we can create a dynamic Meta tags, whenever you will add new product on the website, the dynamic Meta tags will be automatically updated on the product page. Color Based URL and Meta Tags – A product can be in multiple colors and if you will not define your product pages URLs based on color, you can face duplicate product pages Meta title and description issue. Be careful while finalizing URLs structure and dynamic Meta tags. Product Description– Product description should be clear, unique and informative. Just describe product details in your language, think that you are selling product on your website and description should be more attractive as compared to the other websites. Use Schema Snippets – This will help search engines to indentify the webpage and visible information on search engines which you would like to visible, like price, product name, rating and reviews and much more..
H 1 Tag – H1 tag should be included on the every pages of website, especially on product pages, product name can be used as a H1 tag of the product page, it is easily to implement. User Friendly Navigation – Navigation should be user friendly and all important category pages should be linked from home page and subcategory pages should be linked from the category pages, similar for the product pages, product either in category or in sub category, you can keep product within category as well as in sub category pages but the URLs should be same or canonical should be included on both products. Content Interlinking – Providing linking through the webpage content is one of the most valuable idea to pass link juice and traffic on the internal webpages. We must provide interlinking of websites. Kick duplicate and low quality content – You should not use duplicate and low quality content of the web pages. Try to write unique and fresh product description for every product. Related Products/Last Viewed Products/Most Popular Products – For user benefit and product visibility we can use related product section below the product pages. This will keep busy to visitor and improve page views and control bounce time. Review and comment option – People love to read reviews and comment before buying any product online, therefore we must include review and comment section on the product pages. Use rel=”next” and rel=”prev” for Pagination– It is required to indicate paginated content for search engines to indentify the relationship between pagination pages. Use Call to Action Words – If you talk about conversion, then you should include call to action words within your content and the words can be a phone no, book now, buy now etc.. These words can encourage the people to visit your site and take a desired call to action and let your audience know exactly what you want them to do. Use Call to Action Words in Meta Tags – If you want to improve CTR and get response from the visitors, then you must include CTA words in your meta title and description tags. The words can be – Get 30% off, Up to 50% Off, Special Festive Offers, Save 50% etc..
SSL Certificate Implementation – Google had confirmed that he would give preference to the SSL included websites and it is most important for e-commerce website to feel secure visitors, most of visitors don’t like to do online shopping just because of security issues. Image Optimization – Image should be optimized, as Google or other search engines do not read any images without alt tag, we must include alt tag on the every image of website, alt tag should be relevant and descriptive. Also we need to compare the size of the image. Canonical tag Implementation- In e-commerce website, there are always possibility to have a duplicate web pages or the duplicate issues, therefore implementing canonical tag is required on e-commerce website. Breadcrumb Navigation– First it help search engines to index the web pages or help users to identify on which page they first landed or where they are located. Upload product video – Including product video on the products pages will decrease bounce rate of the website and help in conversion optimization. Avoid Pup-ups – Avoid displaying pop ups on the website, pop ups irritates people and most people don’t like pop ups on the website, it will decrease your conversion rate. Hosting Server Location and type- Web hosting and server location is also decrease the website speed time and make it faster, have you heard about cloud hosting? A hosting service that is provided to customers via multiple connected servers that comprises a cloud, as opposed to being provided by a single server or virtual server. This greatly reduces chances of any downtimes in case of a server malfunction. Shipping Information – Product shipping information should be in the product pages. Including term and conditions and charges in the product page is good for user point of view. XML sitemap – XML sitemap should be present on the website, this will help in indexing web pages on search engines. For Google we must create a XML Sitemap and submit in Google webmaster tools to index webpages, as the e-commerce website have thousands of webpages, therefore it is difficult to make a static XML sitemap for website, I would like to prefer to create dynamic XML sitemap for the website. Block unwanted and cart pages – Useless and low priority content pages, admin section and add to cart pages should be blocked through robots.txt file, it deepens on the platform which you have used for developing a website. Deal with 404 and 400 errors – Check dead links and other server issues like 404 error, 500 errors, soft 404 errors on the website and if found remove or fix them. Local Address on the footer – If your online shopping business belongs to the particular destination then you must use local address in the website, you can include address on the footer of the website. Easy payment process – As the easy payment process is not a part of SEO but to make a website user friendly it is required to make payment process easy. If there will complications in payment process the visitor hesitates in doing payment. So be careful while making add to card and payment option for ec-commerce website. Include offer or discount section – What can convert your website visitor as a customer? Make an offer or discount section on the website and put all your discounted products and see the result. Social sharing buttons on Product Pages- You can improve visibility and search social awareness by adding social sharing buttons on the products pages, so many users like to share products on their social media profiles. Customer Support Options – Emil id, telephone number, live chat and other customer support function should be included on the website, this will improve user interface and trust to the business. FAQ and Term & condition page – FAQ and term & condition page is also required on the website, most of people always check the FAQ and term & condition section of website before buying any product from new shopping websites. Custom 404 Page – Custom 404 page should be created for the website, it will be similar as the webpage but will pass 404 server response. If any visitor type a wrong URL related to your website, it should be redirect to the custom 404 page or we are redirect our removed pages to custom 404 page. Ecommerce tracking script implementation –Implement e-commerce tracking script on the website, this will help you to track the product performance and online sales of the product through Google analytics. We hope these tips will help you to improve the performance report of your e-commerce website.